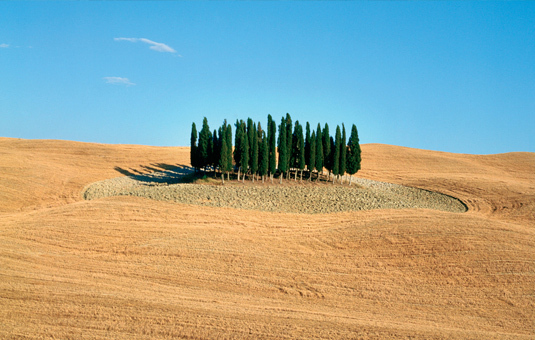 The Val d’Orcia Park of Art, Nature and Culture attracts low-environmental impact tourism. 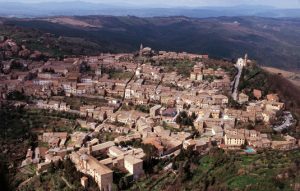 For this reason, a number of itineraries have been created in order to discover and get to know this territory better. These itineraries have been set up in the belief that on foot you see things that otherwise wouldn’t be noticed or enjoyed to the best of the cultural, environmental and historical values of the area. 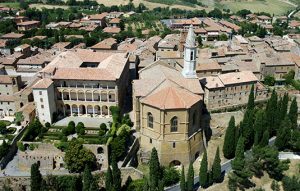 Starting from Torrenieri, we follow the old Cassia road towards Siena until the stadium where we then turn left onto a track that rises up towards Poggio Gambocci. The view from this stretch is open Tuscan countryside and all around you can see cultivated cereal fields and vineyards. Passing the “Comunità Incontro” we descend towards the Altesi crossroads where we turn left and pass the Collodi farmhouse and continue onto provincial road n. 45 del Brunello in Val di Cava. 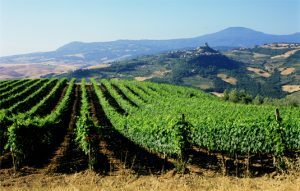 Crossing the provincial road, we take the cart-track towards Colombaiolo up to the turning where we take the right and crossing a bridge over a ditch the path becomes a steep climb through vineyards and cool woodland that surround Montalcino. Passing the abandoned Church of Madonna delle Grazie, we enter the village through the ancient Porta Burelli. Leaving from the village of Torrenieri, we follow the “vecchia Cassia” road towards the small railway station. We continue the asphalted road for around two kilometres until we turn left for Celamonti. We start along a cart way that follows a ridge and passes through a number of farmhouses, giving us enchanting views of the countryside. 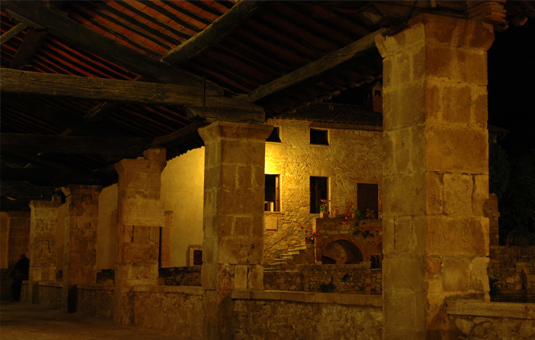 Passing the Celamonti farm, after three kilometres we reach the ancient village of Cosona. 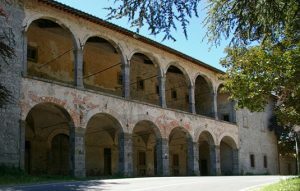 Still following the main road, after two kilometres we find a turning to the left towards Lucignano d’Asso which we walk through and continue to the Poggio Ragnuzzi and San Giorgio farmhouses – the latter is about a kilometre away from the crossing with the asphalted road. Reaching the asphalted road, we turn left onto provincial road n. 71 bordered by woodland and continue for about a kilometre until we can see the road sign and cypress-lined track that leads up towards the monastery of Sant’Anna in Camprena. 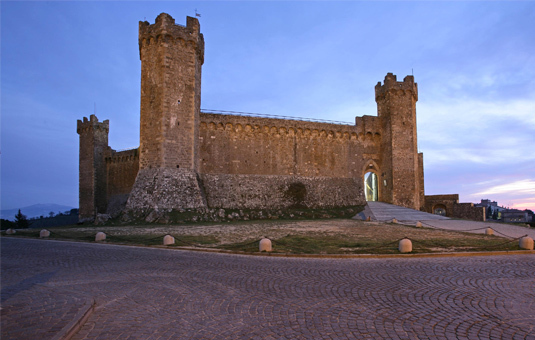 This itinerary starts from Porta Burelli, the ancient gateway to the village of Montalcino. 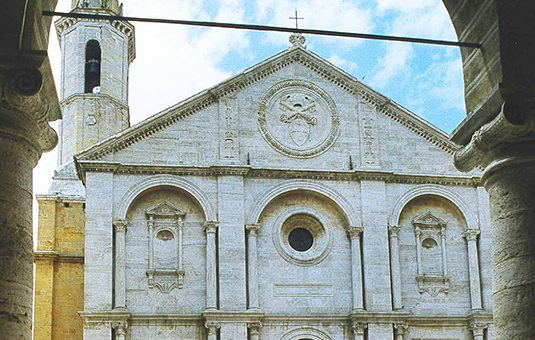 Once out of the gate, we turn right onto the cart way and follow it along to the Canalicchio di Sopra company characterised by the Church of the Black Madonna. 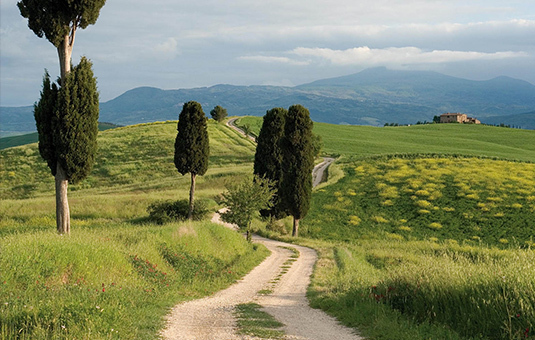 We continue right onto a path that leads us to the provincial Brunello road. Crossing the provincial road, we climb up the asphalted road for a few hundred metres to the Casaccia farmhouse where we turn left onto a cart way that leads onto the typical local landscape of vineyards and cereal fields. The clay ground shows us that the area is of Pliocene origins, when it was invaded by a more or less deep sea of which we are now walking along the bed. 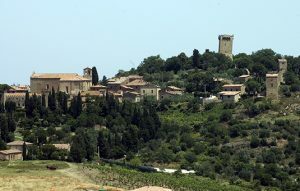 Reaching the provincial road which moves up towards Montalcino from the Cassia road, we keep to the right along the asphalted road and continue up to the Fiesole farmhouse where we meet the path. 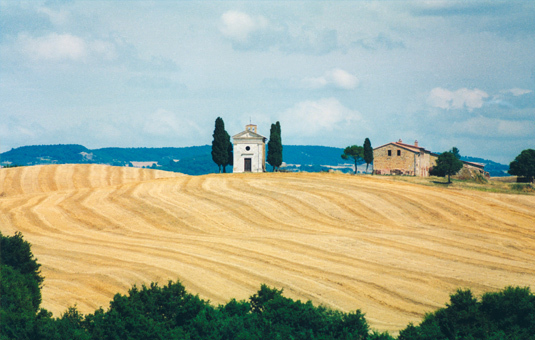 Through fields of clay, we pass the Casello and Pian dell’Asso farmhouses. Immediately afterwards, we cross the railway track and the Asso and Tuoma rivers. 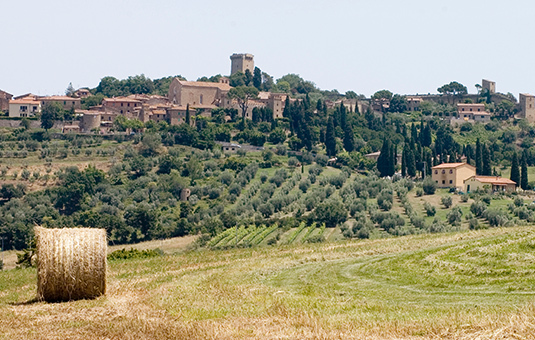 We continue up along the main cart way towards San Quirico d’Orcia leaving the city of Brunello wine behind us. 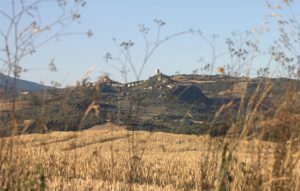 After about three kilometres we arrive at the Madonna di Riguardo, continue straight on for another kilometre and a half towards San Quirico d’Orcia where we are welcomed by the white gates of the Chiesa Collegiata dei Santi Quirico e Giulitta. Leaving the tiny spa village of Bagno Vignoni, we descend towards the Cassia road and turn right at the first cart way. Having crossed the Parco dei Mulini we continue towards the former travertine mine. On a pathway that runs parallel to the River Orcia, we find ourselves immersed in Mediterranean scrubland. The path opens suddenly onto a field that we walk around until we reach the crossroad where to the right wading the River Orcia we reach Castiglione d’Orcia. The itinerary continues on along the ascent known as the “oak wood” in the thick scrub made up mainly of oak trees. 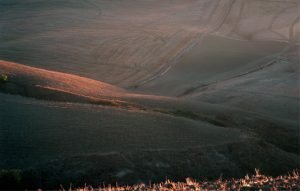 At the top of the ascent we find a cart way, we turn right and continue on a slight ascent passing the Poderuccio and San Savino farmhouses where the track flattens out and borders vineyards and olive groves. 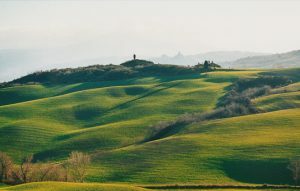 Along this stretch, the gaze looks out over the enchanting valley, and we can enjoy views of the sweet rolling hills scattered with hamlets and farmhouses. 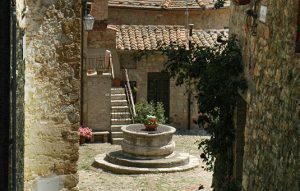 Having passed the Poggio Grande and Romitorio farmhouses we find ourselves at a junction: if we continue straight on the road leads us to the medieval village of San Quirico d’Orcia (around two and a half kilometres away), turning right we walk towards Bagno Vignoni. Along the walk we can see the Rocca in Tentennano, the volcano of the Amiata and in the distance, marking the border of this magical valley, Radicofani. 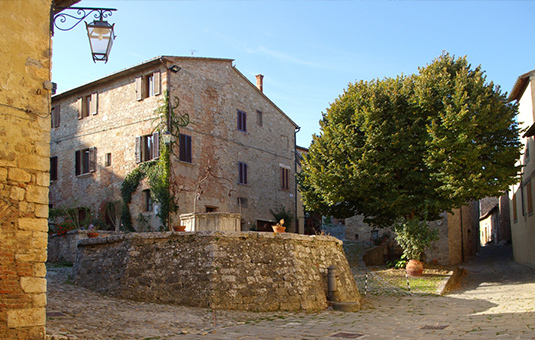 We reach the village of Vignoni Alto via the same road that the pilgrims would have walked and, having crossed the village, a steep descent of about two kilometres leads us to the “piazza d’acqua” (water square) of Bagno Vignoni and the thermal springs that were popular even with the Romans. As the itinerary is a ring road, it can be undertaken in both directions. 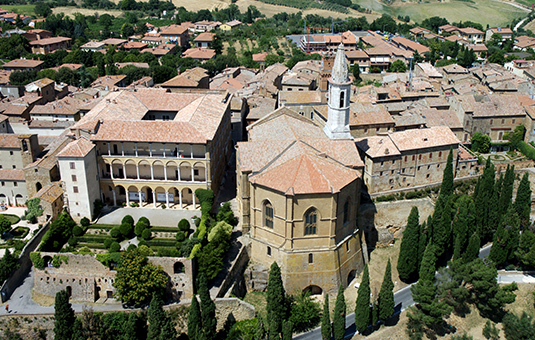 This itinerary starts in Pienza where we cannot but visit Piazza Pio II, a wonder of the Renaissance town recognised in 1996 as a UNESCO World Heritage Site. Following Corso Il Rossellino, we leave through Porta al Ciglio. Crossing the provincial road, we turn left onto a track leading downwards. Along the itinerary we find curious place names such as “the area of the moon milk”. The name appears to come from the Biancane, a local phenomenon formed by the erosion of Pliocene clay terrain, known locally as “large breasts” thanks to their rounded shape. Urban legend has it that on the full moon, this area takes on an enchanted appearance and it looks as if the moon’s energy is able to bring milk from these breast-shaped forms. Our walk continues up and down towards the Tresa valley. 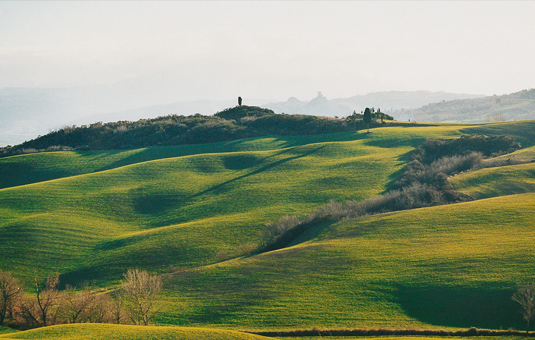 To our backs is Pienza, on the opposite hill lies Monticchiello and in the distance we can make out the profile of Monte Amiata. 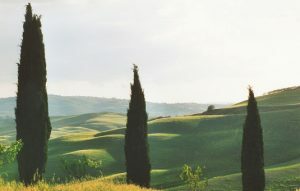 The panoramic path descends to the bottom of the valley and the track, since flattened off, is bordered by a shrub land of broom, privet, cistus, thorns and oaks. When we reach the Casa al Piano farmhouse we turn right and cross a bridge over the Tresa river; to the left is a steep slope that runs upwards for about two kilometres towards the town. 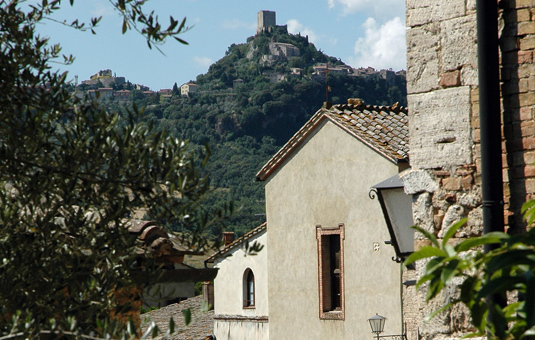 The silhouette of Monticchiello slowly appears and we reach it via a final stretch of asphalted road that runs right up to the city wall. 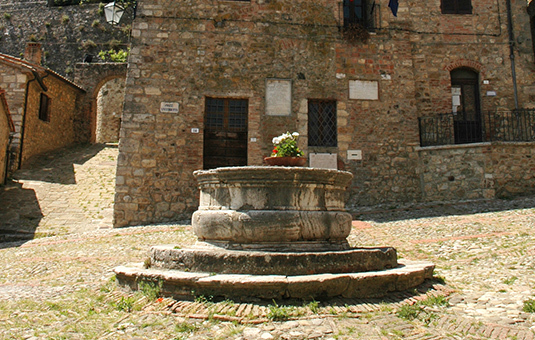 We enter the village via Porta Sant’Agata. This itinerary starts in the very centre of the town, in Piazza Vecchietta; we take Via del Cassero and arrive at Porta di Sopra. Having left the city walls, we turn left onto the asphalted road and after a further hundred metres right onto Via della Bonaria. We continue straight on and the road becomes a track; a little further on at the second turning we take a right. The route unwinds downwards for about two and a half kilometres giving us a broad view from the Amiata, to the Maremma all the way to Val d’Orcia. 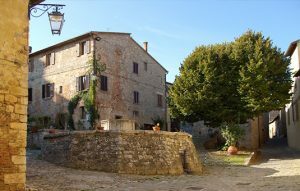 Having passed the Finocchieti farmhouse, we turn right off the main cart way and continuing towards the Scarceta farmhouse. We continue straight on again for eight hundred metres towards Montelaccio. Before going up to the farmhouse, we turn left onto the path that starts descending into the woodland. We keep to the right, on the path that runs parallel to the Orcia River but a few dozen metres higher in the Mediterranean scrubland. The path winds up and down and we cross two streams that are often dry: the Rigo and the Grotte Bianche. 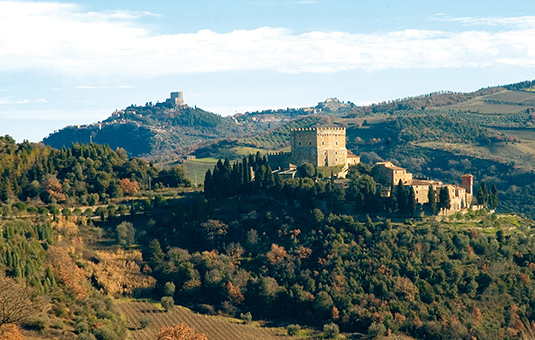 Hidden in the woods we can see the castle of Ripa d’Orcia watching over our journey. 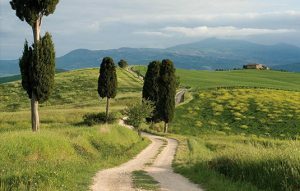 Here we have to look carefully for a turning to the left, marked by a little stone man, which leaves the main track and leads to the Le Molina farmhouse. From here, the road winds up steeply for about two and a half kilometres and as we climb, the imposing silhouette of the Tentennano Fort starts gradually coming into view. 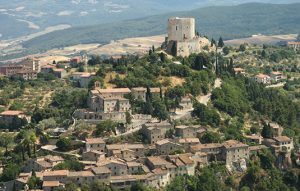 Having passed the Colombaiolo farmhouse, we reach the asphalted road and we turn right towards the village of Rocca d’Orcia. Before the final stretch, we take a well-earned break in the Piazza della Cisterna and then … off to the very top of the Fort where the breath-taking view reminds us of the great strategic value of the Val d’Orcia sentinel. As this itinerary is circular, it can be undertaken in either direction. The itinerary starts from the Piazza della Cisterna in the village of Rocca d’Orcia. From here we follow Via Borgo Maestro down to the stone archway that marks the border of the village. Having reached the small church of Madonna di Manno we immediately turn left onto the asphalted road and at the following crossing, after around fifty metres, we continue straight onto a cart way leading towards the cemetery. Reaching the provincial road, we cross it and continue along the track indicated by the sign “Pozzo”. 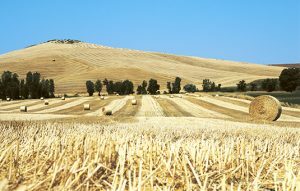 We follow the main track bordered by trees and cultivated fields for about four kilometres. Having arrived at the crossing, we turn left following the brown signs for the Via Francigena. 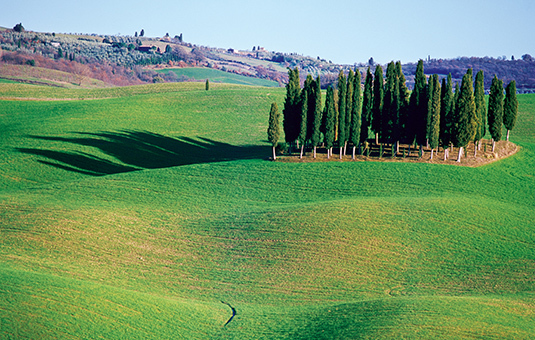 The view opens onto the Val d’Orcia and the path evens off and easy to walk along. 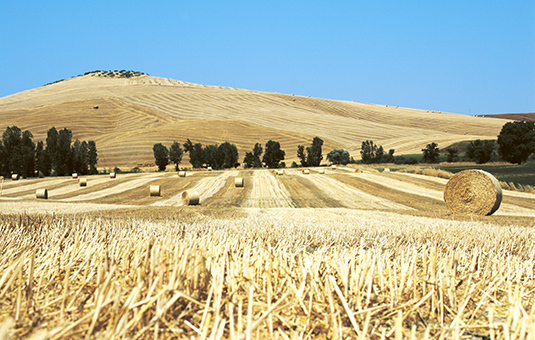 We continue along the main track until we reach Gallina which lies on the 43° parallel. 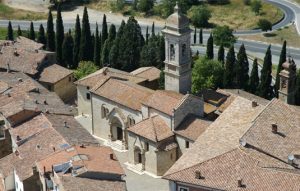 From the historical centre of Radicofani, we continue along Via Matteotti until we reach a Y-shaped crossing where we turn right and once we have reached the wide bend to the right we continue straight onto the track marked with signs for the Via Francigena. We walk along a well-lit track that descends from Radicofani towards the valley of the Rigo river. 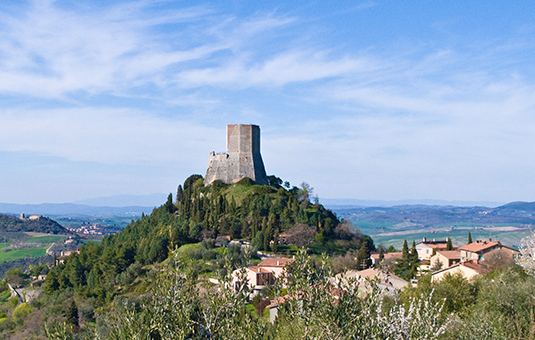 The surrounding view is dominated by hills as far as the eye can see, to the right above is the Monte Amiata and behind us the Rocca di Radicofani. As we leave the Rocca behind us, the landscape – between cereal fields and wide fields of grass and shrubs – is ploughed by ravines of wild and primitive nature. Every so often we find a farmhouse and especially sheep pens, while the road continues descending and, after a series of bends, we pass the Baccanello and La Novella farmhouses. 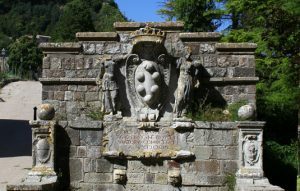 After around a kilometre we reach Ponte a Rigo, a small hamlet of the council of San Casciano dei Bagni between the Rigo river and the Paglia river and which is the most southern place along the Via Francigena in Tuscany. If we want, from Ponte a Rigo we can continue along the Via Francigena towards Acquapendente and follow the first part in Lazio.